YesLaw Online is a web-based transcript, exhibit, and document repository for attorneys. Login is found on the right-hand side of the screen. Your username is the email address you gave to the court reporter. If you have not been assigned a password or have forgotten your password, enter your email address, click “Forgot Password,” and it will be emailed to you. For security, transcript and exhibit orders are published only to attorneys who have ordered court reporting services. If you would like any legal support personnel to receive transcript and exhibit deliveries by email, just let the court reporter or our office staff know so that additional recipients can be added to transcript deliveries. More repository access options. Case material is presented in a familiar “case tree” structure with each case a separate entry in the case tree at the highest level in the hierarchy. Within the Depositions/Transcripts folder, each deposition transcript is listed by deponent and deposition date. Exhibits can be accessed separately by clicking on the “Exhibits” folder. To download any single file, transcript or exhibit, click the download icon in the “Action” column to the right of the filename. To download multiple files, place a check in the box to the left of the files you wish to download and click “Download.” When more than one file is downloaded at the same time, files will be saved to a single .zip file. For the convenience of our clients, our electronic package includes all of the popular file types used by attorneys and legal professionals, including ASCII, E-Transcript, PDF Full Size, and PDF Bundle. The popular PDF bundle includes the condensed transcript, hyperlinked word index, hyperlinked exhibits if ordered (OCR searchable), and ASCII text file in a single PDF. Other files included with the bundle include Summation ASCII, LEF (LiveNote), and MDB (Sanction) files. Our PDF bundle contains no java code. PDF files containing java code may prevent e‑filing by some court malware screening software. E-Transcript files are listed just under the exhibit folder. In order to view E-Transcript files, they must first be downloaded to your PC. 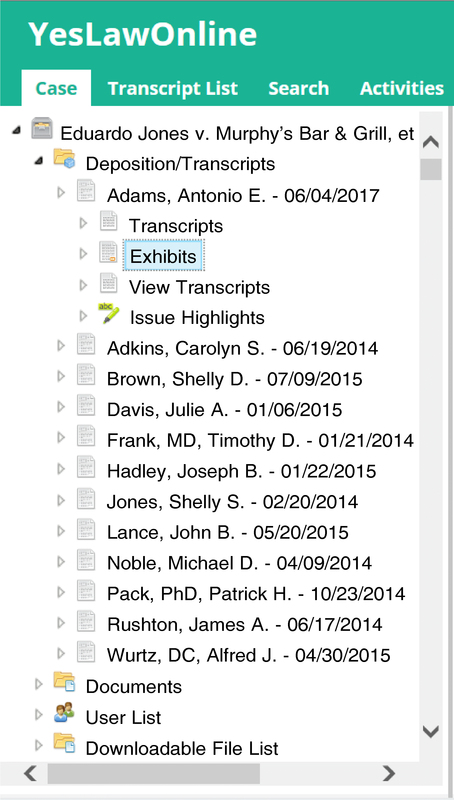 If you have not opened an E‑Transcript file on your computer before, download and install the E-Transcript Viewer. If you prefer to review E‑Transcript files on your iOS device, check out Case Notebook E-Transcript in the App Store. Learn more about popular file types used by attorneys and legal pros. Our outstanding administrative support allows you to focus on the things you want to focus on without the headaches and hassles of developing your own team and making a significant financial investment. Using our services, your company can offer full-service court reporting, from scheduling to delivery, including the extras you would expect from a full-service firm. We help promote your professional image with a strong presence, enabling you to easily compete with large local and national firms. One of our goals is to provide tools to assist our reporter clients. We trust that the links on this page will be useful. Please let us know if you have additional links you would like to share.